Learn about Cavan's bid to become Ireland's Foodie Destination 2018! Cavan hopes to Taste success in Foodie Destinations! Cavan has been selected as one of the Top Ten 'Foodie Destinations' in Ireland, and we need the voting public to help secure the number one spot for the Breffni County. Voting opens at noon at on Wednesday, 25 July and takes just a few seconds. Simply log on to http://www.foodiedestinations.ie/city/cavan to register your vote! Voting is open until noon on Tuesday, 21 August. Organised by the Restaurants Association of Ireland, Foodie Destinations celebrates Ireland’s unique and wonderful food offering, and encourages local food tourism initiatives across the country. 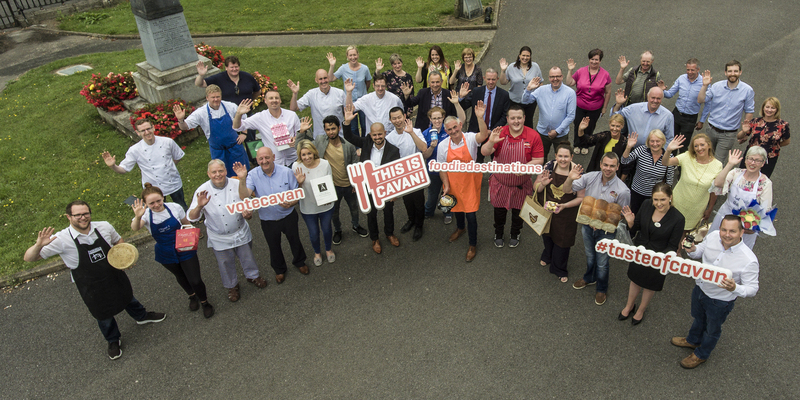 Cavan's application is backed by food producers, restaurants, cafés, B&Bs, hotels and food businesses across the county, as well as organisations including Cavan County Council, Cavan Chamber, Local Enterprise Office Cavan, and Cavan Monaghan Education and Training Board. High-profile Cavan chefs including Neven Maguire and Gearóid Lynch have also thrown their weight behind Cavan's application, with Neven commenting, "In food terms, the Cavan visitor experience has grown and improved immeasurably, not only in the form of destination dining experiences such as that offered here at MacNean House, but in independent coffee shops, gastro-pubs and restaurants across the county, where locally sourced food is widely available, and the story of that food informs the visitor experience almost as much as the taste. Visitors now depart our county enthusing about our food just as much as they do our stunning scenery and rich heritage". Olde Post Inn Chef-Proprietor Gearóid Lynch, a Fáilte Ireland Food Champion, agrees that Cavan "offers a truly special food experience unlike any other". "From east to west, this county is blessed with passionate and inventive chefs, farmers and food producers who work daily to ensure that visitors to our county have a memorable food experience", said Chef Lynch. Speaking following the shortlisting of Cavan as a finalist, Cathaoirleach of Cavan County Council, Cllr Madeleine Argue, said "Cavan is off the beaten track, a hidden gem that has been recognised as "Ireland's Hidden Heartlands". Visitors come to Cavan to see authenticity, to experience an Ireland the guidebook does not show, and Cavan's food experience takes that "otherness" and applies it to the visitor's palate". "'Cavanbert' cheese, 'Chocolate Chip and honeycomb' sausages, and 'Rhubarb and Custard Jam' are among the quirky, exciting food offerings that this county produces, a distillation of the Cavan personality - offbeat and intriguing," added Cllr Argue. The final stage of the application will be a judges' visit which will take place in August, already a busy month in the Cavan food calendar, as the county lines up to host the annual Taste of Cavan food festival, which takes place in Cavan Equestrian Centre on Friday, 10th and Saturday, 11th August. Taste of Cavan Co-ordinator Majella Tierney said that the festival has been a building block for greater co-operation in the local food industry in Cavan over the past seven years. "The food tourism experience has evolved of late, and today's foodie visitor looks for not only a great taste, but a great experience. Taste of Cavan has shown that there is a desire out there for quality local produce, and I think you can see that when you look at menus throughout the county" said Ms Tierney. "This year's festival will be another fantastic opportunity to enjoy a fun family day out while trying the best Cavan has to offer. I would encourage everyone to come join us at Taste of Cavan on 10 and 11 August, and of course, to vote for Cavan!" To vote for Cavan as the 2018 Foodie Destination, visit http://www.foodiedestinations.ie/city/cavan before noon on Tuesday, 21 August.